Florida's beach is where you want to be! 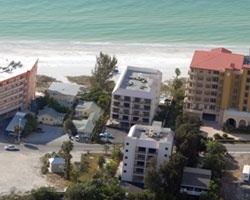 The *Bay and Beach Club* is close to everything, yet you'll enjoy the serenity and privacy you crave when at the resort. A beautiful peninsula located on Florida's west coast, the area is bordered by the Gulf of Mexico to the west and by Tampa Bay to the east. Home of Fort De Soto Park, America's #1-rated beach, the area offers 35 miles of white-sand beaches on eight major barrier islands. You're within minutes of many popular Florida attractions: just 30 minutes to Busch Gardens in Tampa and 90 minutes to Walt Disney World Resort, SeaWorld and Universal Studios in Orlando! All reasonable offers will be considered, Price Reduced, Motivated seller!